My dreams came true at the Barrington Theatre on 2 June when The Dreamers, formerly ‘Freddie and The Dreamers’ performed on stage nearly 40 years after appearing (in pantomime) at the Pavilion in Bournemouth. They remain one of the best known bands from the 60s’ music circuit. Alan Mosca and Bryan Byng have been in the band as Freddie and The Dreamers, and then The Dreamers, for over 37 years. 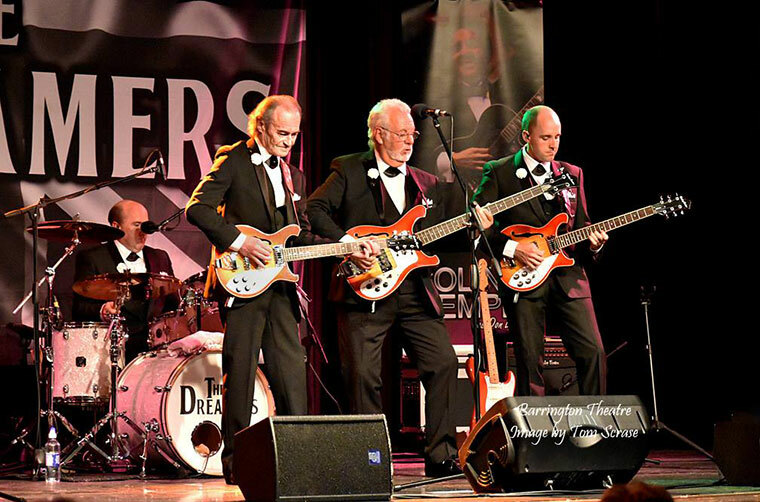 Alan and Bryan are joined by The Temple Bros, the UK’s Official No 1 tribute to the Everly Brothers (awarded by The National Music Tribute Awards 2017), Steve and Colin Temple, who in their own right are seasoned professionals. They have toured extensively with their Everly Brothers show, and add an extra dimension to the Dreamers. Just as the Everly Brothers were, the Temple Brothers are indeed brothers, their harmonies are phenomenal and the concert is one I will dream about for a long while.